A once busy Little Chef and petrol station at the side of the A31. 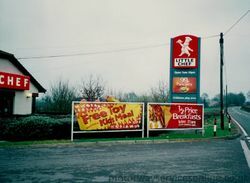 The Little Chef in 1991. Red Post is a road junction just west of here, named after its red fingerpost. A property called Red Post Bungalow was built next to the A31, and then a workshop was built next to it in 1978. In 1981 there were plans to build a petrol station and a restaurant here. The petrol station opened first, and a Happy Eater opened in 1985. 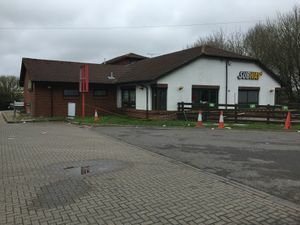 This became the Bere Regis branch of Little ChefHistory in 1996, which gained a Subway franchise in 2014. In January 2018 the Little Chef had to be converted to EG Diner after the new owners lost the rights to the name. The restaurant closed in summer of 2018 with no plans to replace it. Following the closure of the restaurant, the petrol station followed shortly behind in late 2018 when it closed. It had been previously been branded BP and Total in the past.